This complete guide to understanding and using triads for rhythm and lead guitar unlocks the mysteries of triads. It includes theory, practical advice, valuable tips, and tons of examples to get you playing rhythm and lead guitar with triads. Many styles are covered � rock, classical, reggae, metal, blues and more! The book includes online access to audio examples for download or streaming. 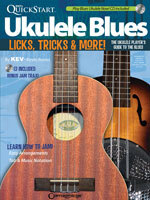 Thinking about playing the ukulele? UKE can do it! 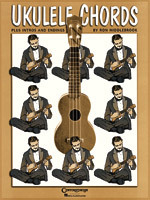 This book is an excellent introduction to the world of the ukulele. With the method presented here, you should gain a basic understanding of the instrument, and amaze & impress your friends and family with your new knowledge and playing abilities! Many of the Exersongs� in this book are done in tablature and standard music notation with chords so you can practice strumming, or play the melody and picking patterns along with the CD. Get started today! 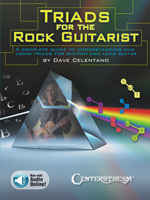 This book is designed as a guide to help you learn to play & jam to the blues. 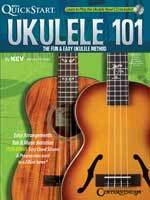 The method presented in this book with CD (67 lesson tracks PLUS bonus Jam Traxs) will enable you to gain a basic understanding of blues ukulele to amaze and impress your friends, family, and even your dog with your new knowledge and playing abilities! Written in standard music notation and tablature, you�ll learn blues form, 12-bar blues, blues shuffle rhythm, 8-bar blues shuffle, the secret method of jamming, how to bend the notes, blues scales in different keys, minor blues, blues songs, bonus jam trax and much more. This book will have you playing blues in no time! 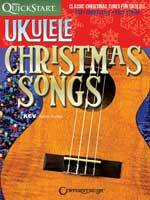 12 popular Christmas songs are presented in this collection, arranged by Kevin Rones for easy fingerstyle ukulele. Songs include: Away in a Manger � Carol of the Bells � Deck the Hall � God Rest Ye Merry, Gentlemen � Hark! The Herald Angels Sing � Jingle Bells � Joy to the World � O Come All Ye Faithful � O Christmas Tree � The First Noel � We Three Kings of Orient Are � We Wish You a Merry Christmas.